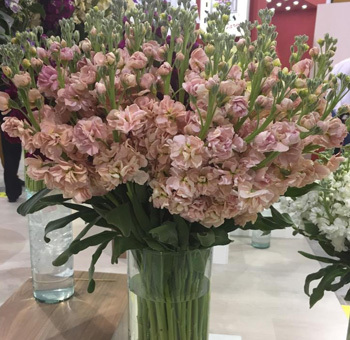 Stock is a type of flower that is highly used in weddings and special events, creating beautiful complements to wedding flowers, bridal bouquets, centerpieces and more. They are also known as Virginia Stock and Gillyflower, coming in a wide range of colorful shades for your perfect event is available throughout the year. This is filler that is sold by the stem and is never warehoused or stored so you receive the maximum freshness. Stock flowers are sweet-smelling flowers that will always be a plus to your inventory. They have a fragrance that is spicy as well as sweet. These flowers are native of Europe, Asia Minor and produce an abundance of flowers on long stems. 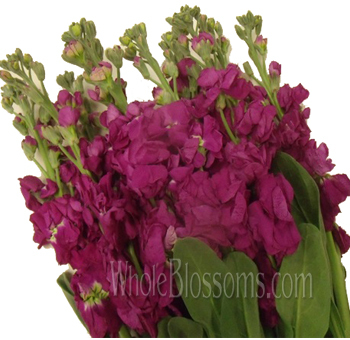 These flowers are only favorable for a colder environment and bloom at a higher rate in cool places. 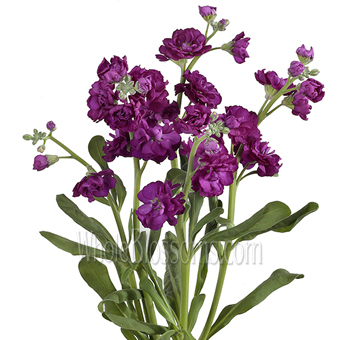 These flowers are generally grown easily and therefore found in abundance. Along with their stems, these flowers are about two and a half feet tall. 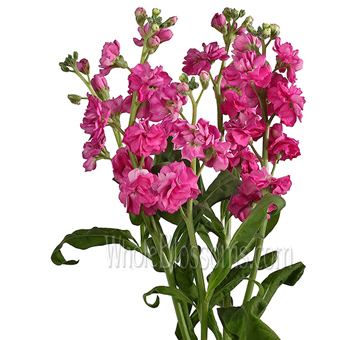 Stock flowers are also known as Gillyflower or a Matthiola. These flowers have got a sort of soft and rubbery foliage. 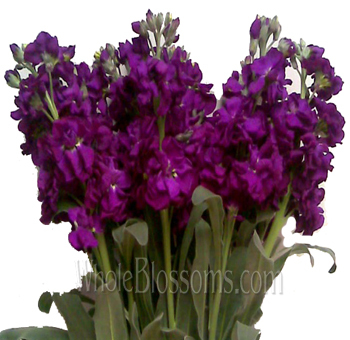 It is a really attractive looking flower which can help change the aura of any place with its distinctive smell. These flowers are a popular choice amongst the people as they make for good cut flowers for indoor arrangements like weddings and special events. 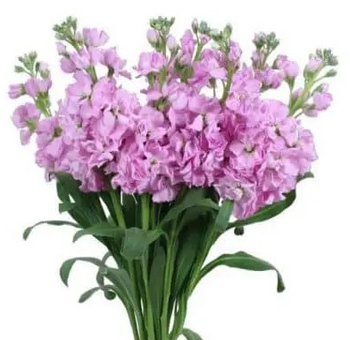 It might also interest you to know that the stock flowers are symbolism of a long life full of happiness and success, contentment, beauty,and spiritual connection. 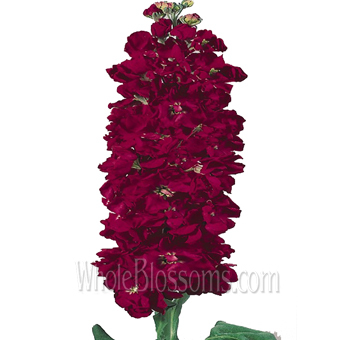 These beautiful flowers are also available in a dwarf variety which is about 8 -12 inch tall. These flowers look great when used as a filling in any floral arrangements especially wedding bouquets, centerpieces, and boutonnieres. 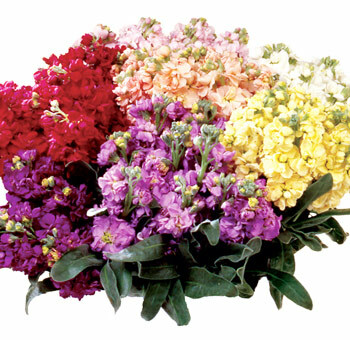 As they come in tall and dwarf varieties, they can be used accordingly to provide a length to your floral arrangement. Place dwarf varieties up front, and the tall ones at the back and create a beautiful floral arrangement of your own. You can put this arrangement in a container also for that extra rich look. 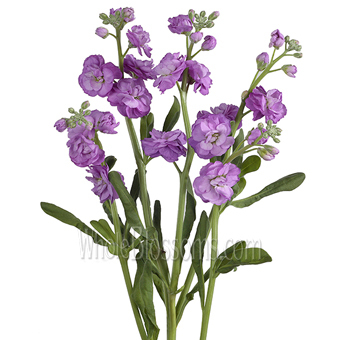 An interesting thing to know about the stock flowers is their edible qualities. As the flowers feature a spicy taste, these work very well in garnishes and salads. The beautiful colors are a treat to the eyes, and their spicy flavor is a treat on the mouth, making these flowers an overall treat on the plate. But remember not to eat their leaves and roots as they are quite bitter in taste. In addition to these enchanting stock flowers being fragrant, these flowers are found in a wide range of attractive and bright colors. Stock flowers are found in a large variety of colors varying from pink, white, magenta, red, crimson, yellow, lavender and many more. Each color of these stock flowers has an attraction of their own. While white stock flowers symbolize purity, the red and pink stock flowers are symbolic of passion and love. The lavender and purple stock flowers express restrained joy while the yellow stock flowers are associated with happiness. Choosing these stock flowers according to their symbolic meanings is a great way of expressing your own emotions. But if we talk of happy times and especially festivities like weddings, the white stock flowers are an unsurpassable choice. 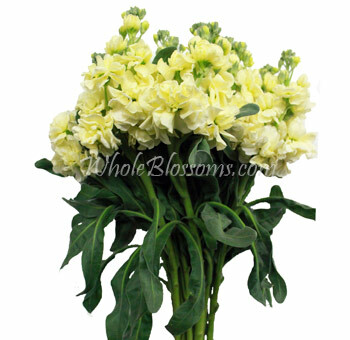 White stock flowers look magnificent is any floral wedding arrangement. Everyone loves the color white, as it is symbol or purity, peace, love, and harmony. So, whenever people gather for any auspicious event this color creates tranquility in the environment. 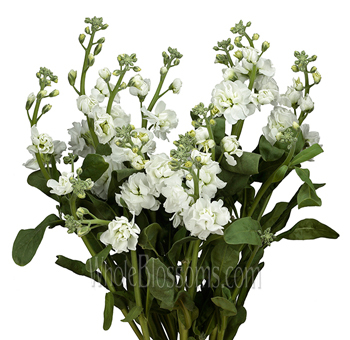 The beautiful white stock flower along with its enchanting fragrance is the best pick for any wedding floral arrangement. Be it a bridal bouquet, a wedding centerpiece or a boutonniere, choosing a white stock flower along with complementing foliage and greens is a good way to go. These flowers can be combined with any colors to create a magnificent piece which can draw anyone attention. Now that we have talked a lot about the stock flowers, the question that comes ahead is where we can procure these beautiful flowers from at affordable prices. When it comes to buying good quality flowers in bulk, WholeBlossoms is the ultimate online website from where you can order fresh flowers at the click of a button. Get hold of good quality stock flowers at this amazingly convenient website. They deliver fresh and pristine flowers to the location of your choice with magnificent care and protection. Whether you're looking for flowers to create floral centerpieces for a wedding or using stock flowers as a part of wedding bouquets, their quality, and care delivery is sure to create smiles all around. All their flowers are handpicked and delivered by professionals, ensuring timely delivery every time. Being United States premier online florist service, they strive to offer you the best packages possible by delivering fresh florist flowers to their customers. They understand, when using an online service such as this, that what you send represents you personally and professionally. Their goal is to provide smooth deliveries every time with results that are designed to impress. If you require a personal touch or have any specific flowersthat you are not able to find anywhere else, contact them and they'll surely have it.